Doesn’t matter the ship, doesn’t matter the ports, doesn’t matter the passengers, the wheelchair is still a conversation magnet. It seems to draw in people who want to talk and share. It makes Shannon laugh when it happens and I admit I hear some great stories and don’t mind sharing my own…with the occasional embellishment! The freewheel is going to indispensable for travelling. It weighs a lot, so limits luggage a bit, but for travelling ports of call that weren’t designed with wheelchairs in mind, it works wonders. Broken pavement, cobblestones (I wish I had it in Boston! ), I can’t wait to try it out in older cities in Europe. Speaking of Europe, this cruise had by far the largest contingent of European travellers we’ve seen yet…and with that came two observations. the men are WAY to enamored of their Speedos! (or banana hammocks as they came to be known). Friends don’t let friends wear Speedos! Especially hairy friends! I learned that the cruise lines aren’t kidding when they say they will leave you behind if you are too late getting back to port. On our last port call in Cozumel, we were delayed a half hour as 350 guests were late. Those guests had booked on a cruise recommended tour, so the ship was obligated to wait for them. Earlier in the day, we had been docked beside the sister ship to our own, the Freedom of the Seas (we were on it last year), and it had a cast off time about an hour before our own. As the stragglers arrived, we were watching from deck 4 and curious to see a family of 3 split off and having an animated discussion with an officer of our ship. It turned out they were passengers on the Freedom, which had left an hour earlier. Somehow they either got split from their group, or explored on their own and got stuck…and now they were really stuck. They couldn’t board our ship, immigration wouldn’t allow that. All their belongings were on the ship that had left. All they had were their clothes, the blue RC towels and we really hoped they had their passports and wallets. They were truly up a creek, though an RC representative was with them and trying to help. Worst fear of cruising come to life. Given how we enjoy exploring on our own, this hit hard…no clue how they ended up. I learned that there really are Americans who travel with a Canadian patch, as we met a couple from Texas who proudly admitted to it. 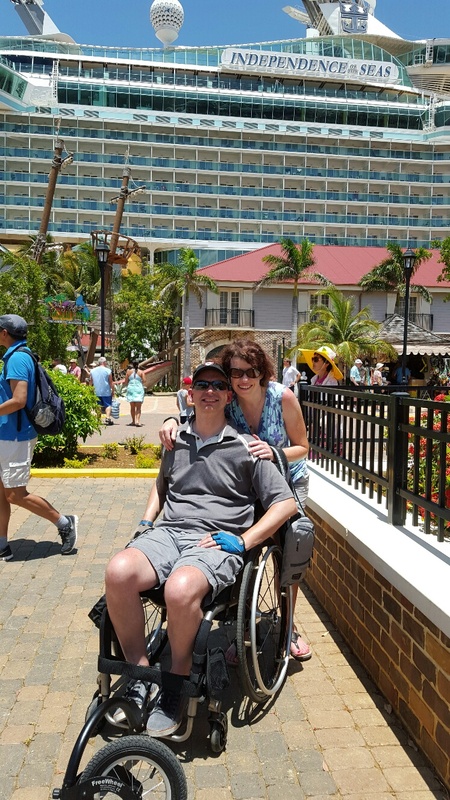 He was in a power chair, with a story that eclipsed mine for his spinal injury. Fell off a bull he was riding, snapped bones in his neck and lower back. Yep…I lose on that one. Great talker, was proud to say he wasn’t popular in Texas as he never believed in the Iraq War…we advised him that if anyone asked while he was travelling with a Canadian flag that he should say he was from Alberta…his thick Texan accent MIGHT not be called out as a dead giveaway. I learned that a teenager with full-blown Cerebral Palsy (and don’t think of him as a kid with what he’s gone through) travelling with his mother for their first ever cruise can share stories, empathize with life on wheels, the joys of spasticity and have a fantastic sense of humour despite how hard it was for him to communicate back. He’ll never see this, but Philip and your dear mom, it was a pleasure to meet you both, hear your story and share an hour of late night conversation. His dignity and their combined strength and humour were humbling. As a sidenote: I learned that an airline will screw up the seating for anyone with a disability as badly as they have me. Philip ended up having a middle seat in row 33 of an Air Canada flight. Seriously??? I finally understood the downside to the cruise industry while visiting the new port of Falmouth in Jamaica. The port opened in 2011, to accommodate the largest of the new cruise ships coming out. It is an amazingly well put together port, even having a Dairy Queen and a Quiznos inside its walls. It’s a great jumping off point if you’ve booked some excursions, however, if your goal is to wander on your own, you don’t have to go far to see the downside of the cruise vacation industry in this historic town. We didn’t get to see much…the church that is the parish for Usain Bolt, but beyond that, just the real sense of poverty that exists around that port. Having a job in the port stores must be like a gold when you see them outside those walls, desperate for a few bucks to find you a taxi, walk you through to a place with the best Jerk chicken, or just to braid your hair. The sale of knockoff backpacks, socks and watches, having less to do with the tourists and more with school season coming up. Falmouth was a far cry from the jewelry stores of Nassau and the boardwalk of St. Martin. It left me wondering how much of the money from tourism really filters down into the local economy…and how little else there is other than that tourist buck to be made…at least of what little I saw. I learned that after 5 years in a row of cruises, it is possible to get cruise burnout. We almost booked a cruise in the baltic that would have gone to Russia for next summer…but after some long discussion, we passed on it. Time for something different next year. I found one of the best souvenir T-shirts in a simple tourist shop on Grand Cayman…logo done up in a pirate-y font that reads: Scars are just tattoos with better stories. Kinda like that one. So here’s the next adventure, meeting new people and getting annoyed with others..and being sure to occidentally run over their feet in the elevators in the process. Love hearing your stories. Question: Why does freewheel count as luggage? Couldn’t u put it on chair from the beginning? Chair doesn’t count as luggage does it? It’s a good question, but the problem is the freewheel isn’t a permanently attached device. It clamps on and clamps off quite simply and there is no way I’d leave it to go with the chair in cargo. Could I take it off and have it as carry on? Perhaps but it’s awkward…we flew Southwest which still allows 2 free bags per person so that made it easier. The Freewheel is not really meant for indoor use either. It kills the chairs turning radius and gets way to easy to take out other people’s legs…though that is tempting actually.